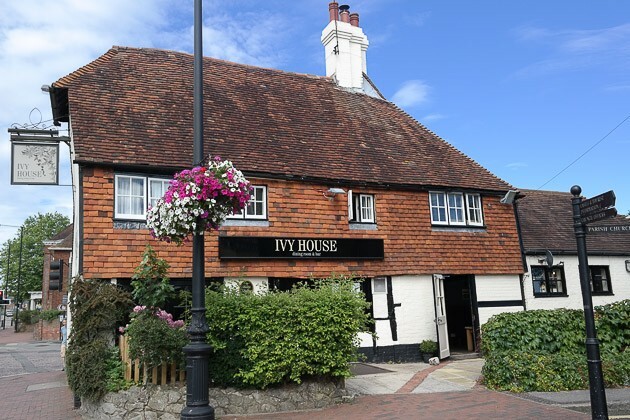 We were at a loose end on Sunday so decided to venture down to Tonbridge and try The Ivy House – we have been to The Dog Inn in Canterbury previously which is a sister venue (not reviewed yet). It was wery easy to book a table, I phone the previous evening and explained the dietary requirements for our toddler, JW (gluten, wheat and dairy free). There was a small car park behind the venue – and a free council run car park on Sundays too. The Ivy House was an old building in good repair, the venue was split into two rooms and a small patio area outside. Where we were sitting, there was a large (open) fireplace and chimney. Unfortunately they dit not have high chairs so it was a bit awkward with JW. The large chairs were comfortable and the table laid out. As they also had a bar area, it was nice to be able to order a pint of lager, which was an Amstel. Claire ordered a soda and lime. 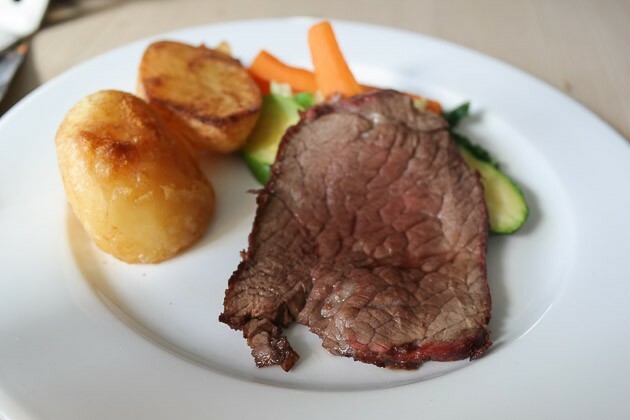 Food was brought out quite quickly – mine consisted of two slices of pink beef, and some pork belly along with 3.5 roast potatoes for me. 2 potatoes for jw. I also had two lots of stuffing, a Yorkshire pudding, cauliflower, carrots and greens. 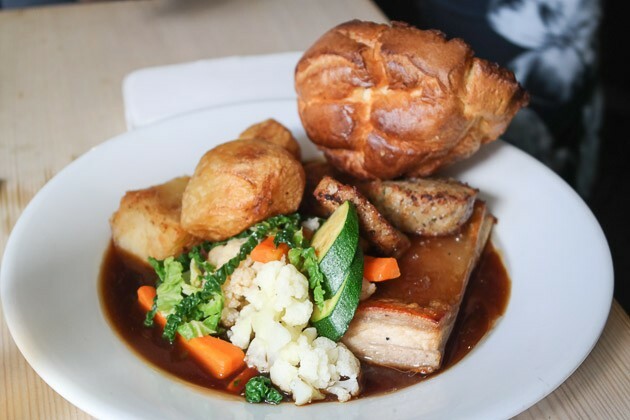 Overall, an average Sunday lunch, let down by not very nice pork belly. 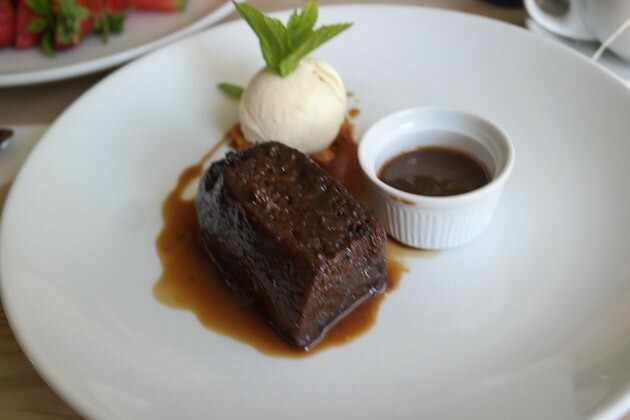 I ordered the sticky toffee pudding which was nice, it had a lot of sugary sauce and honeycomb was hidden under the ice-cream. 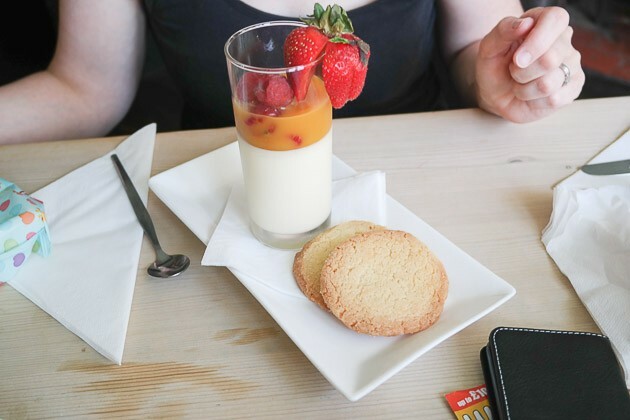 Claire ordered the lemon posset with passionfruit sauce – it was supposed to come with shortbread but instead was some other kind of biscuit (it was not “short”, anyway). The lemon posset itself had a delicate flavour, but was severely overpowered by the extremely sour passionfruit sauce – certainly spoilt it for Claire. 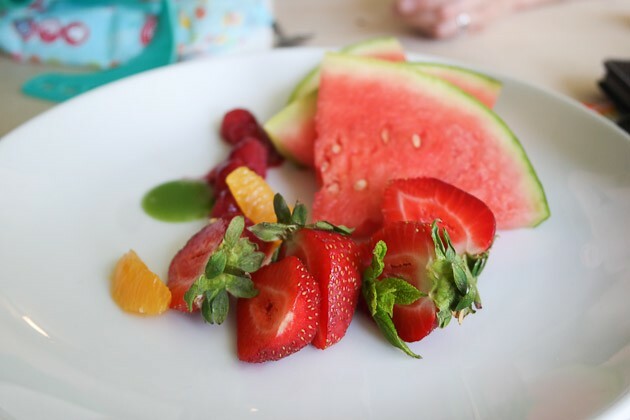 They did serve a great plate of fruit for JW – including watermelon, his favourite! Oh, and the coffee machine was broken!! I was offered a very bad instant coffee (the waitress words), but thankfully they had green tea (my second choice). Shame though, a nice instant coffee isn’t that much money to buy from the shop. We didn’t need to use any baby changing facilities, but I am not sure if they had any to use – especially if they didn’t have any high chairs! We had to use large cushions for him to sit on instead – being very careful that the roast dinner doesn’t fall on them. Due to the instability of cushions on a chair, he actually feel off, I managed to grab his arm just as he was falling and catch him before he hit the ground – otherwise it would have been a nasty fall. So, definitely not one to visit if you have young children. 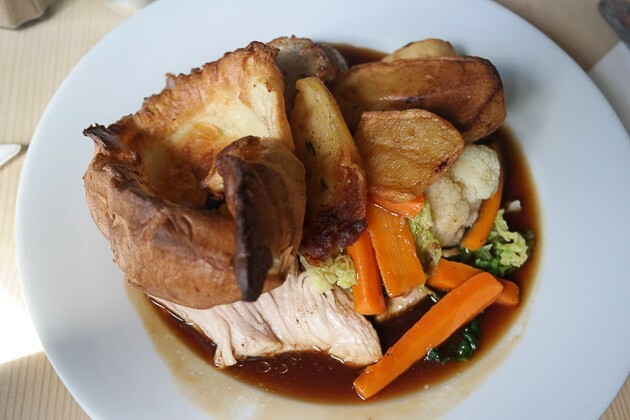 I had fairly high expectations with The Ivy House having a good experience at their sister venue – but unfortunately today was a disappointment. The service was friendly but quite slow (perhaps just too many customers with two people working?) – it took a while to get service with each course along with drinks etc. The pork belly wasn’t very nice, but the potatoes were good. Really, it was the fact that they didn’t have a high chair so JW fell off the chair that did it mostly for me though (for Claire, it was this along with the overpowering passionfruit sauce for the lemon posset). So, an average 3 out of 5 for The Ivy House – might be ok if you live in the area (and do not have young children).